What makes Blemish Control different? Unlike prescription medications Blemish Control is made with 100 % natural ingredients. It penetrates deep beneath the skin's surface and works with your own immune system to rid your skin of the bacteria that ultimately becomes a blemish. Unlike using traditional treatments that give you temporary results, Blemish Control will clear your skin and keep it clear with daily maintenance. Since 100% of the ingredients in Blemish Control are active you need only a small amount to do the job. Some people will need to use the crème only twice a week to maintain their skin after the first week of treatment. The results may vary from one skin type to another. We have found that most people experience clearing in about a week, some may take two to three weeks. Another interesting fact about Blemish Control is how it is made. Unlike commercial skin preparations sold over the counter, Blemish Control is made fresh in very small batches. The ingredients used are the highest quality available worldwide. The 2 doctors, who formulated this product exclusively for us, hold several patents on skin care formulas that are used successfully world wide to treat very difficult skin ailments. We are truly fortunate to have their extraordinary knowledge and talents available to us. Their patented process makes it possible to blend the skin healing effects of Zinc Oxide with the transdermal effects of emu oil. This union makes the most unique, exciting acne formulation on the market today. 100% Natural Ingredients: Dromaius Oil, Borage Seed Oil, Jojoba Oil, Sulfur, Zinc Oxide, Tea Tree Oil, White Willow Bark Extract, Arnica, Camomile, Marigold, Burdock, Aloe Vera, Camphor, Eucalyptus, Vitamin E, Green Tea. I suggest starting with the .5 oz. trial size. If you are using this strictly on your face the .5 oz. size should last about 2 months. Use Blemish Control very sparingly. More is not better with this product. When you open the jar you will notice the distinct odor of camphor and eucalyptus. This odor will subside soon after application. You may feel cooling and tingling when first applied. We suggest you start with a spot test on your face. Do not apply over your entire face the first day. Start with a small part of your face, such as the chin area. Remember, this product goes into the skin to kill bacteria so you may experience a flaring or increase in blemishes the first several days. This may not be the most pleasant time for you, but your reward will be clear skin for life. This is why we suggest a spot test. Start in a small area so you will know what to expect. During the first week of use you may experience some exfoliation of your skin. This is a normal process and will subside. Clear healthy skin will soon appear. Using emu oil or Super Rich Moisturizer will help moisturize any dryness you may experience. How do I use Blemish Control? Because Blemish Control is a one-step program, you can apply the crème before bedtime or in the morning on a clean face. Some people use Blemish Control twice a day, but you can decide the amount needed after several days of use. Apply a VERY SMALL amount on your test area. Massage gently into skin until the crème disappears. If needed, use an all- natural moisturizer along with the Blemish Control if your skin becomes too dry. Emu oil or Super Rich Moisturizer is the perfect partner to Blemish Control. Remember, the more natural ingredients, the better for the skin. Many commercial moisturizers contain ingredients that are not good for the skin. A moisturizer should feed and nourish the skin. After your face has cleared you may need to use the crème every second or third day to maintain your healthy skin. I would love to receive your input and hear your success stories. It helps us help others. just palmed me off with prescriptions for powerful drugs that could only do me long-term damage. I will spread the word." I just wanted to take a moment to tell you what a great product you have. Ordering it was probably the smartest thing that I have ever done in my life. About 4 months ago I had a breakout of dermatitis and acne. I never had this problem in my life. The rashes on my cheeks have been so severe, that a lot of days I would not want to leave house. People would ask me what happened to my face? I could not even look people in the eye. I have been using so many different creams and nothing really worked. Sometimes the topical steroids would literally hurt my face. My face would be in pain. I have been to 5 dermatologists. I have been to Acupuncture. I have been to a nutritionist. I have been to an allergist. All totaled I think I have spent well over $2000. With 2 days of using your cream, symptoms were better. And within 5 days it is almost all gone. You have such a wonderful product and I am eternally grateful. "Just wanted to tell you what a huge improvement I have seen using your products. My face is no longer red, and the acne is gone, and the smoothness is returning. Thank you so much...you have given me back the face I used to have!!" "I have to say a huge thank you to your company regarding the Blemish Control I received. 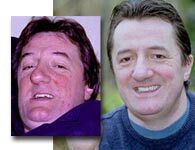 I have been battling rosacea and acne for over 15 years and within a week I noticed a huge difference!!! It is a wonderful product that has greatly increased my self-esteem!!!" Your AR formula has COMPLETELY CLEARED UP MY awful case of acne rosacea...it is truly unbelievable....a miracle if you ask me. I am thrilled with your product! I was so skeptical because I had tried so many different things. I can't begin to tell you how much this means to me- my self confidence had plummeted over the last year especially when my rosacea became really inflamed and angry- I feel like I've got my "spark" back and my joy- THANK YOU VERY MUCH for this amazing product.